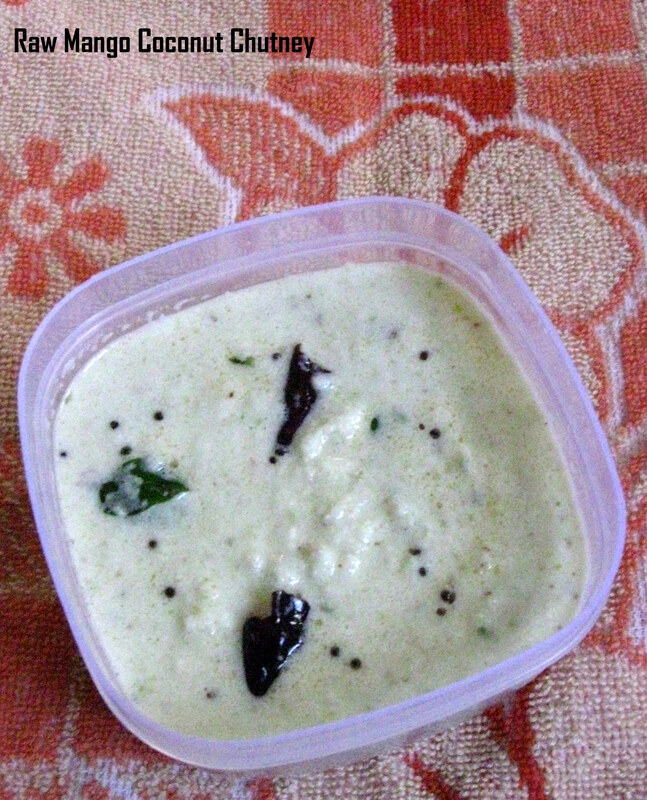 Manga Thenga Chutney is a traditional Kerala dish. And it is always a must prepared dish at Palakkad homes. It is simple, easy to prepare side dish for breakfast and it is tasty as well. Here at my home, this Manga- Thenga chutney is always prepared during the mango season. It is spicy and tangy too. There are two versions of this chutney. One is called the Manga-Thenga chutney which is exclusively prepared as a side dish for breakfast or tiffin varieties like idli, dosa and uthappam. This type is prepared by grinding together of raw mango, grated coconut, green chillies and then seasoned. The other version is the Manga-Thenga Chammanthi which is an excellent side dish for rice, molagootal, molagushiyam, kootan or kootu saadam and especially the curd rice. It can also be had for idli, dosa, chapathi or roti as well, but tastes best with rice dishes. This version is usually prepared by frying the spices and then grinding it with the chopped raw mango, grated coconut, red chillies and optionally a little jaggery is added to balance the tanginess of the mangoes. Today, i am posting the simple manga thenga chutney for breakfast like idli and dosa. I will post the other version some time soon. Grind all the ingredients under the ‘ingredients table’ into a coarse paste. Transfer it into a small bowl. In a seasoning laddle, season with the items given under ‘For seasoning’ and pour over the chutney. Mix well. Adjust the quantity of coconut depending upon the sourness of the mango. Use more coconut if the mango is very sour. Add green chillies as per the spiciness needed or add chillies to adjust the sourness of the raw mango. Interesting variation of the coconut chutney. Thanks! Thank you. Appreciate for your comments! Appreciate for sharing your thoughts Kirthi. Nice to know that even in coastal Andhra, this chutney is prepared 🙂 Even i love this chutney for its tanginess and sweetness! !